Thank you to everyone who attended the Annual Christmas Open House. We were thrilled with the turnout (despite the dreary weather) and are so thankful to you, our loyal customers for helping us spread the holiday cheer. We hope you enjoyed the Christmas decor and displays. 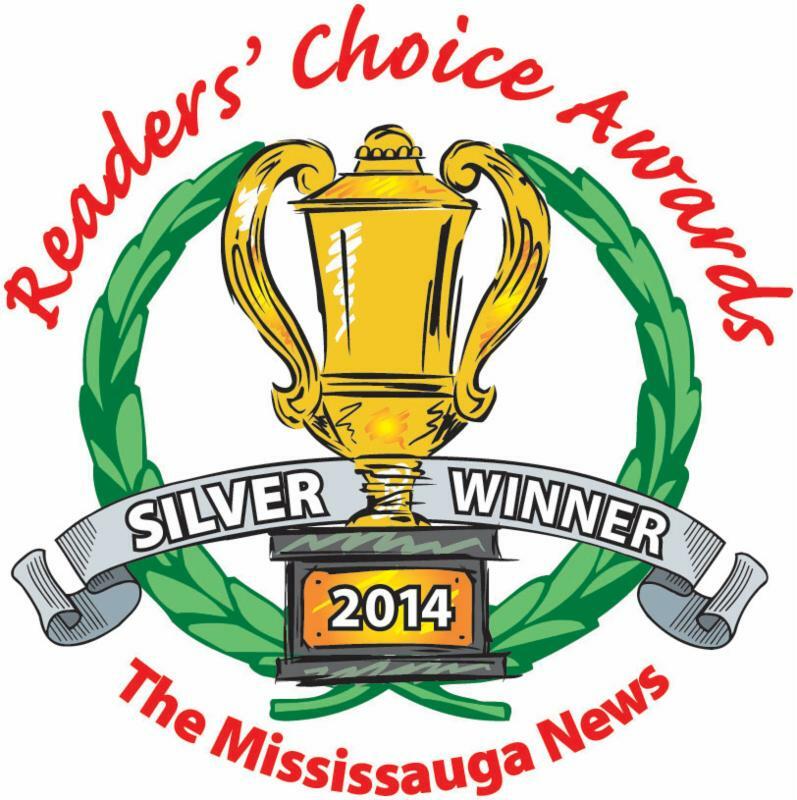 If you have one of these receipts, please call to claim your prize at (905-567-9795). New numbers will be drawn if prizes aren't claimed by Thursday, November 8, 2018. The best way to enjoy a stress free holiday season is to get started as early as possible . Preparing for the holidays should be a fun experience whether you go it alone or have recruits to help. A glass of wine or mulled apple cider, Christmas tunes, and holiday fragrance filling your home helps make the preparation part of the fun. Using high quality faux greenery, flowers and holiday decor allows you to extend the season and not have to worry about maintenance. 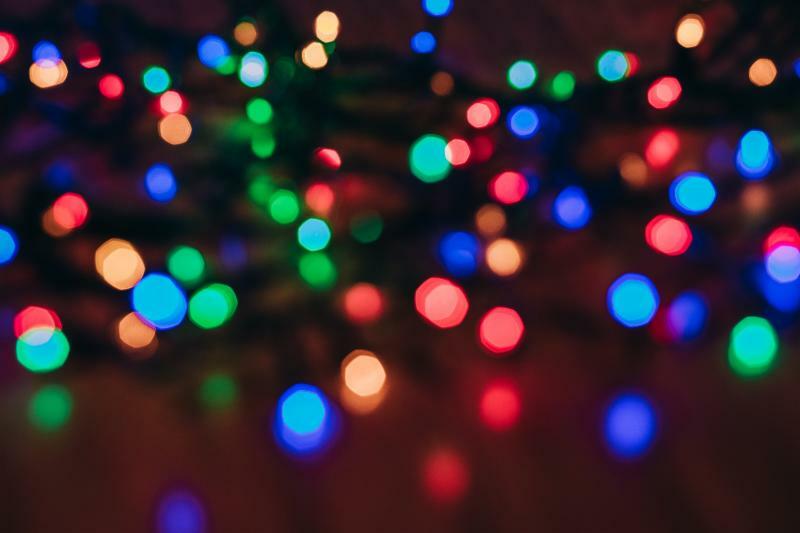 As Christmas decorating pros, we've put together this email to provide holiday tips and ideas as we move into the holiday season. 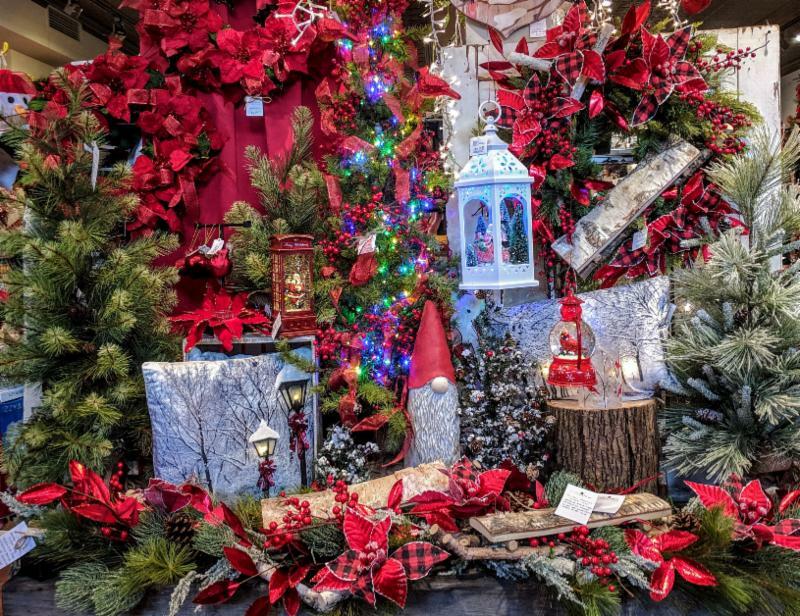 The floral wreaths, garlands, and centrepieces are spectacular this season - all are one of a kind creations made at Crafted Decor. Dazzle with elegance this season. 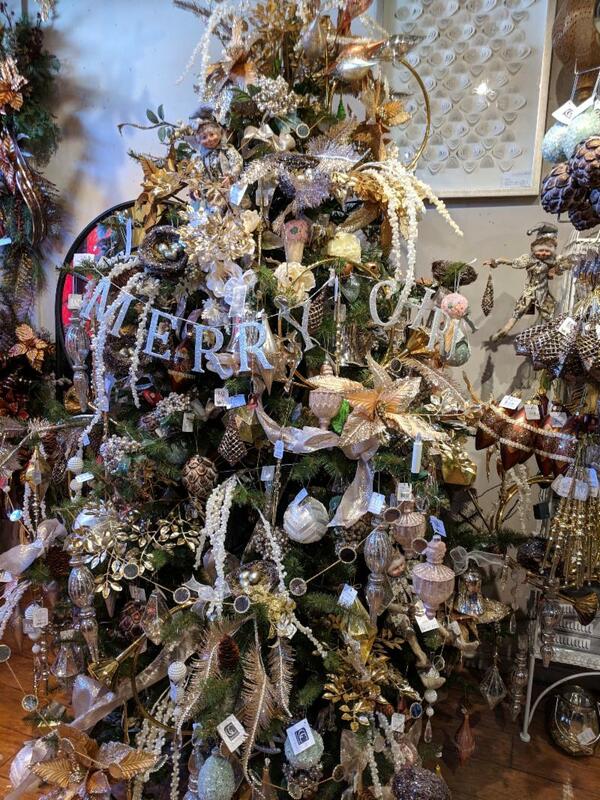 Ornate notes of gold, glitter, rhinestones and iridescent pearls take your tree to gorgeous luxury. With today's more monochromatic decor, this combination of classic shades of gold and cream where a huge hit last year and has returned with all NEW decorations, unique trim, and baubles so you can continue to add to your tree. A black and white motif is perfect for a modern aesthetic. There are formal black tassels, statement floral stems, and interesting ornaments. The most important element when using this colour scheme is the colour of the tree. A light coloured tree (green or silver) with create a perfect backdrop for all the black, white and silver accessories. 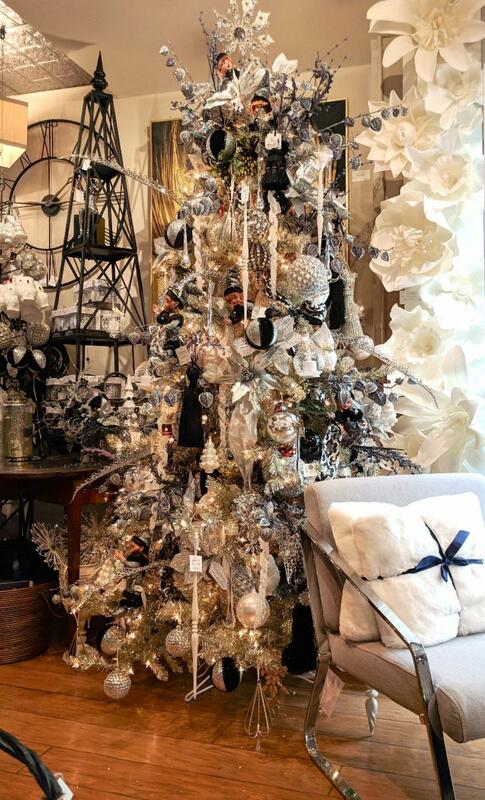 This champagne tinsel tree pictured, is perfect in a smaller space because it is tall and thin, with lots of tips to hang your decorations and lots of lights to make them sparkle. Also available in a table top version for those in small spaces that want to add sparkle without the need for a lot of decorations. Available for sale already decorated (everything wired on for instant decorating) or create your own masterpiece. Especially useful for those with limited mobility as well. Buffalo Plaid has prevailed for a long time as a rustic pattern . In recent years, it has come to the forefront as one of the trendiest patterns to brace home decor and fashion. 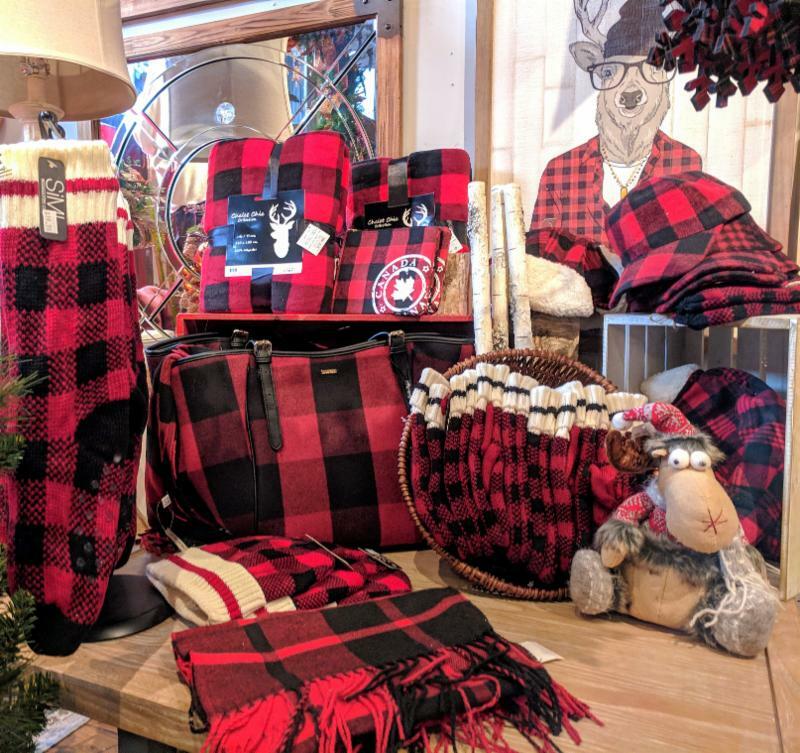 Buffalo plaid accents are a great addition for those of you who have nature or rustic tree themes. As well, any accessories are great left out all winter long and bring a natural, cozy vibe. 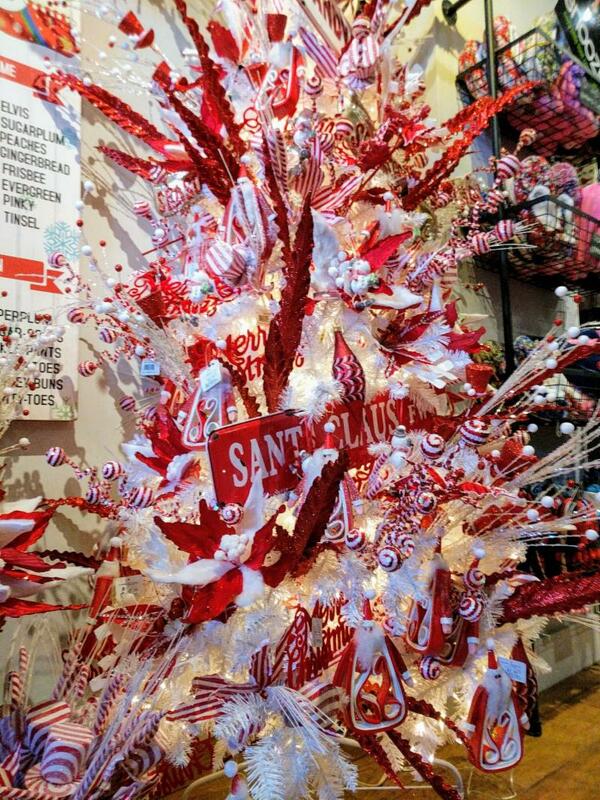 The inspiration for this tree and decor comes from a long-time Christmas tradition - the candy cane. 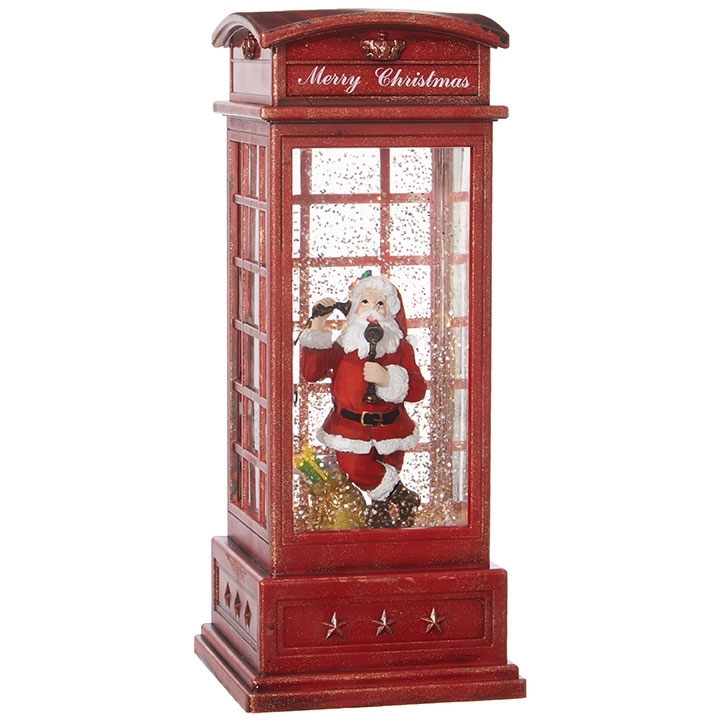 Red and white decorations evoke sweet childhood memories of past holidays. This theme is best suited on a heavily flocked tree or a white tree (as pictured here). Excellent theme idea for a kitchen or family room. There are alot of interesting flowers and picks if you would like to just a punch of peppermint to any room. 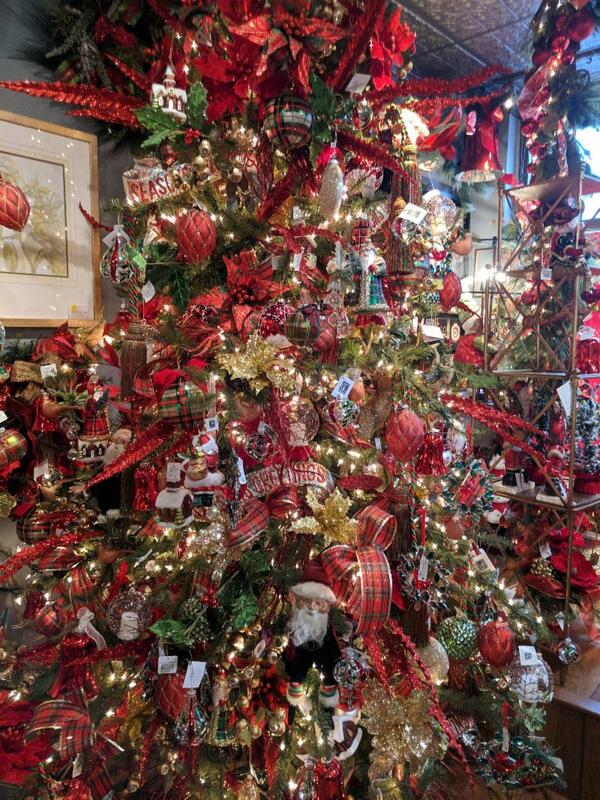 This years' traditional tree pays homage to a festive combination of red, gold and green. 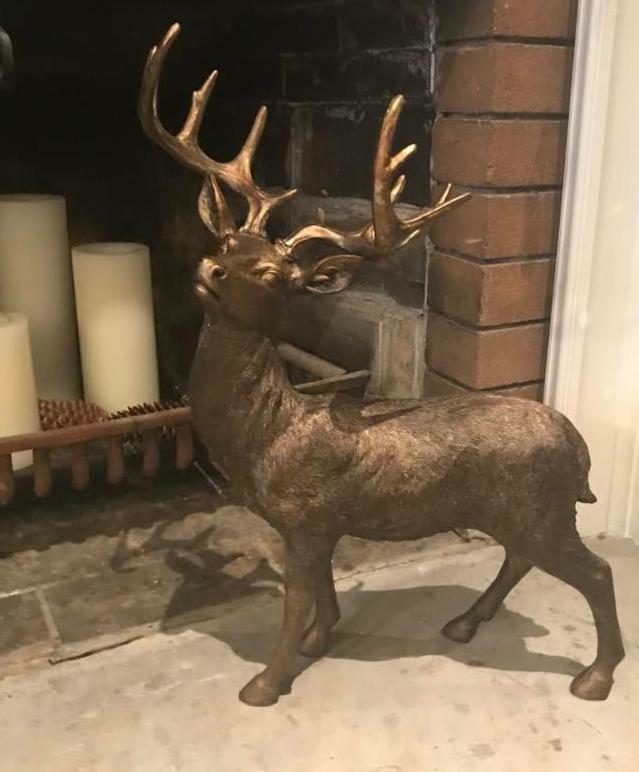 Every year, when Phyllis and I start the Christmas buying for the following year, we wonder how we can possibly re-invent our traditional theme again. However, once we arrive in showrooms full of beautiful, traditional colours with exciting NEW ornaments and decoration - it's hard to narrow down our selection. This year, these traditional colours were represented in a plaid motif with a beautiful result. 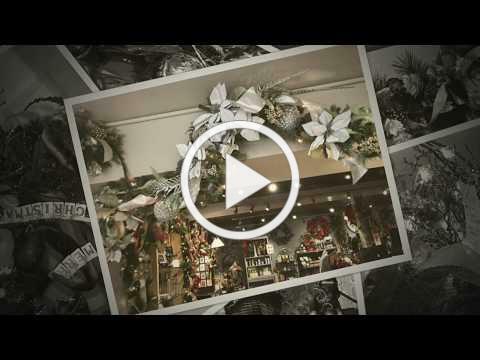 You will be amazed by the amount of unique wreaths, garlands, sprays, mantle sprays, and arrangements at the store this holiday season. 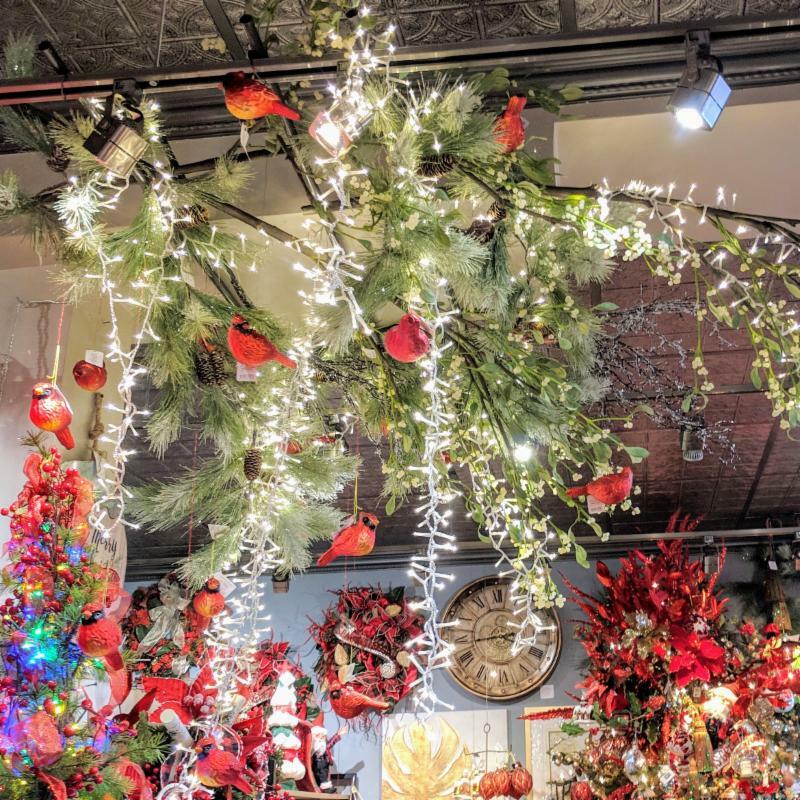 There is something for every taste and budget from whimsy and fun to glamorous, following the holiday themes Crafted Decor is featuring this season. As always, they are one-of-a-kind creations made at Crafted Decor for our customers, using quality flowers and unique embellishments. Bring your Christmas decorating to life! 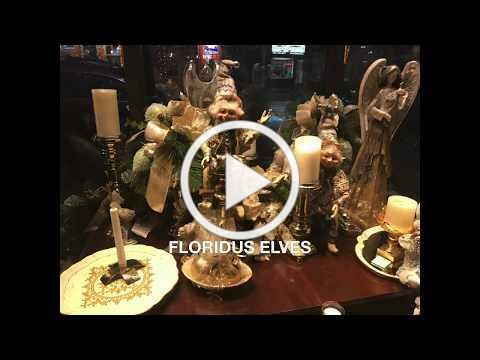 Floridus Elves are sweet and festive collectible figurines that add a whimsical flair to any holiday space. These adorable figurines feature a hand-painted face and fully posable body. They come in a range of sizes from 12 - 26 inches. Clothing details and embellishments are exclusive to each elf, making them a whimsical addition to your banister, staircase, tree, garland or even standing on your mantel or hanging from a lantern. 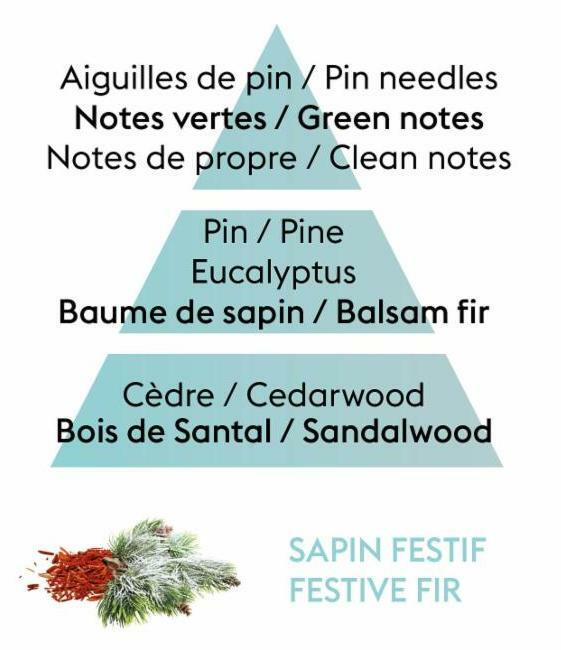 Set the Christmas mood in your home with a fresh and woodsy fragrance. 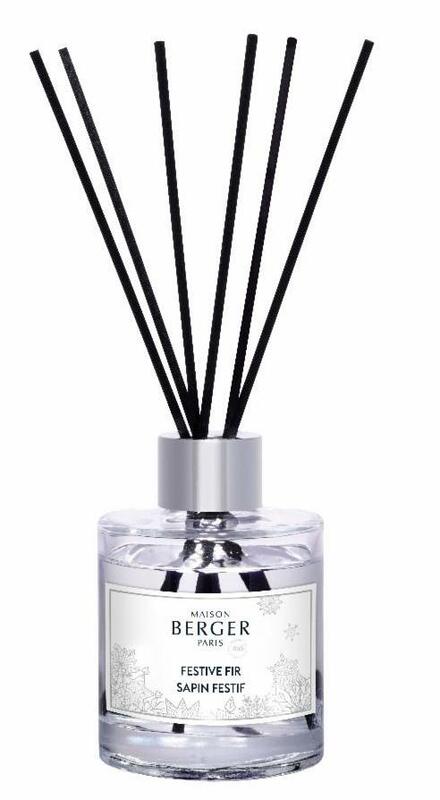 Maison Berger's Festive Fir is the perfect seasonal scent. Available in candle, diffuser and of course Lampe Berger fuel. 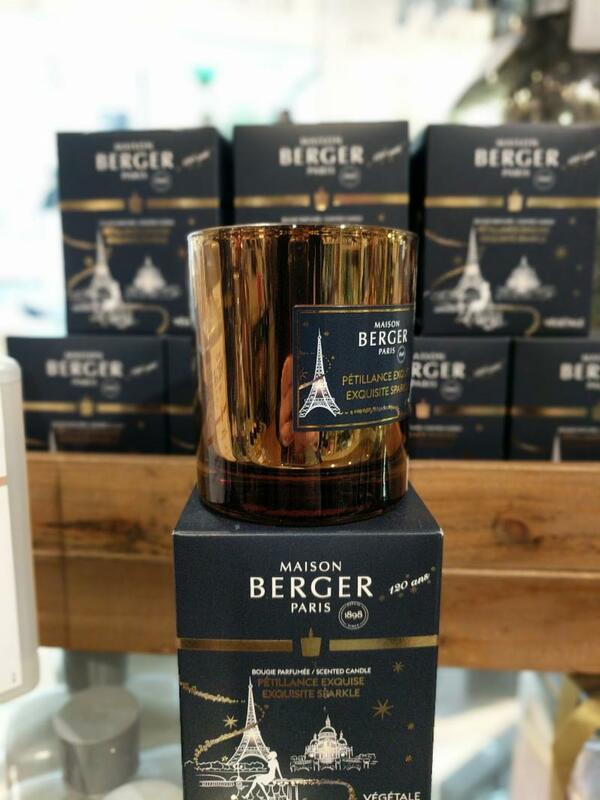 An enchanting scent reflective of holiday celebrations by Maison Berger. 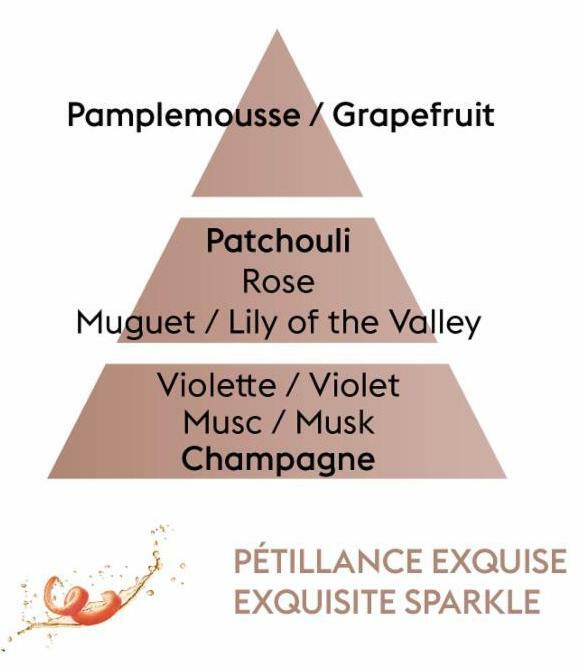 Grapefruit top notes give way to floral hints, finishing with soft notes of Violet and Champagne. Available in candle and Lampe Berger fuel. This elegant Kissing Krystal ornaments brings a little bit of love and sparkle to any place you wish to hang these statement pieces. 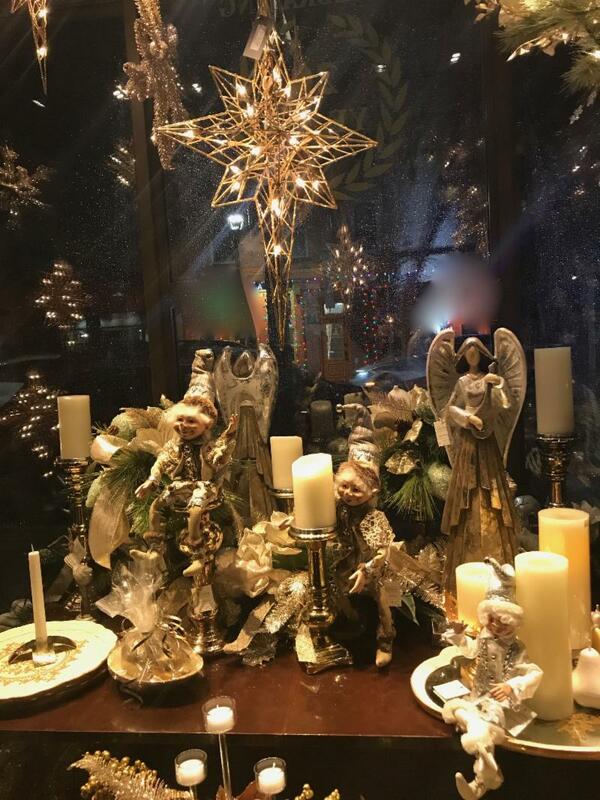 Available in angels as well, this line has been a popular item at Crafted Decor - always selling out weeks before Christmas - so don't delay or you will be disappointed. NEW this year are these beautiful flickering candle Kissing Krystals Light-Up Ornaments which create warmth in any decor space. These ornaments feature LuxuryLite LED candles with a realistic flickering flame and 60 hour battery life, and operates on a 5 hour timer. Universal remote also available if you wish to hang them in your tree. *numerous styles available throughout the store. 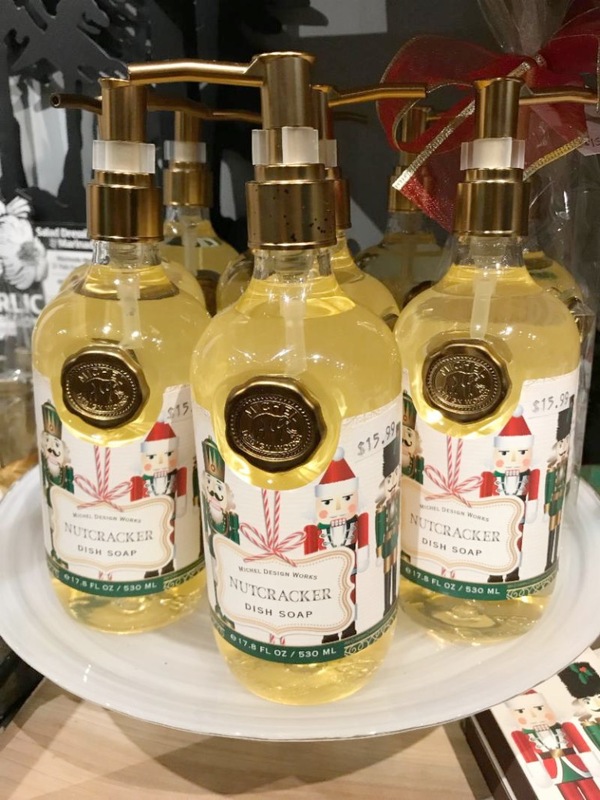 Michel Design Works brings a beautiful variety of holiday inspired home goods including soap pumps, napkins, bar soap, dish soap (NEW) and more. A Crafted Decor favourite, be sure to check out the "Nutcracker" and "Christmas Time" selections. 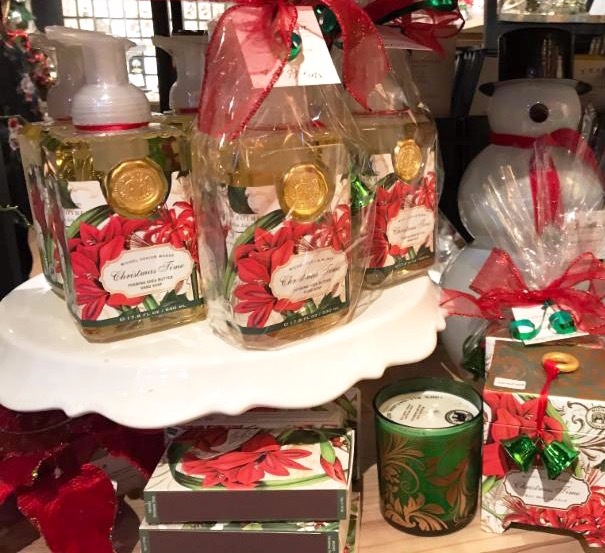 The beautiful patterns and wonderful fragrances are the perfect way to welcome your guests this season. RAZ Imports cluster lights are the next generation of LED lights. The Cluster Lights are available plug-in or battery operated and are virtually indestructible. These lights emit an invitingly warm yet luminous effect, and are so easy to wind through garlands, wreaths and trees. Now, you can easily create a table scape with a LIGHTED garland. 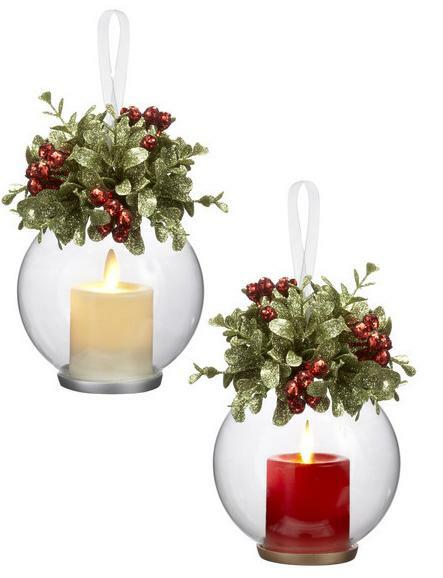 Cheerful holiday lanterns grace any table top or mantle with continuous shimmering light. You won't be disappointed by this years selection as the popularity of these lanterns continues to grow. Get yours early, these items tend to sells out quickly. 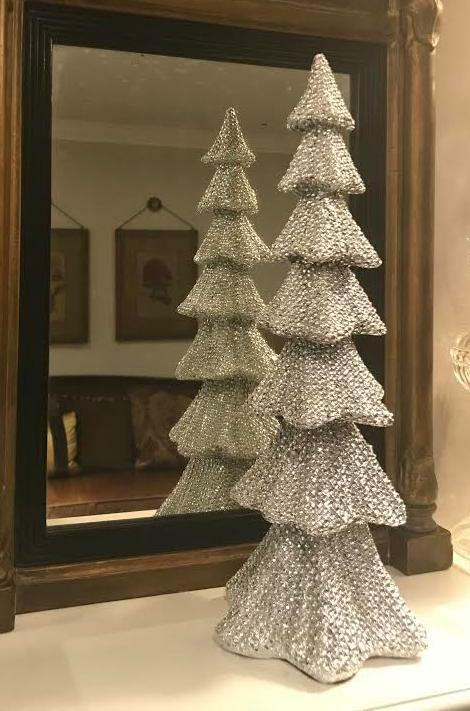 Make tree lighting unique this year. 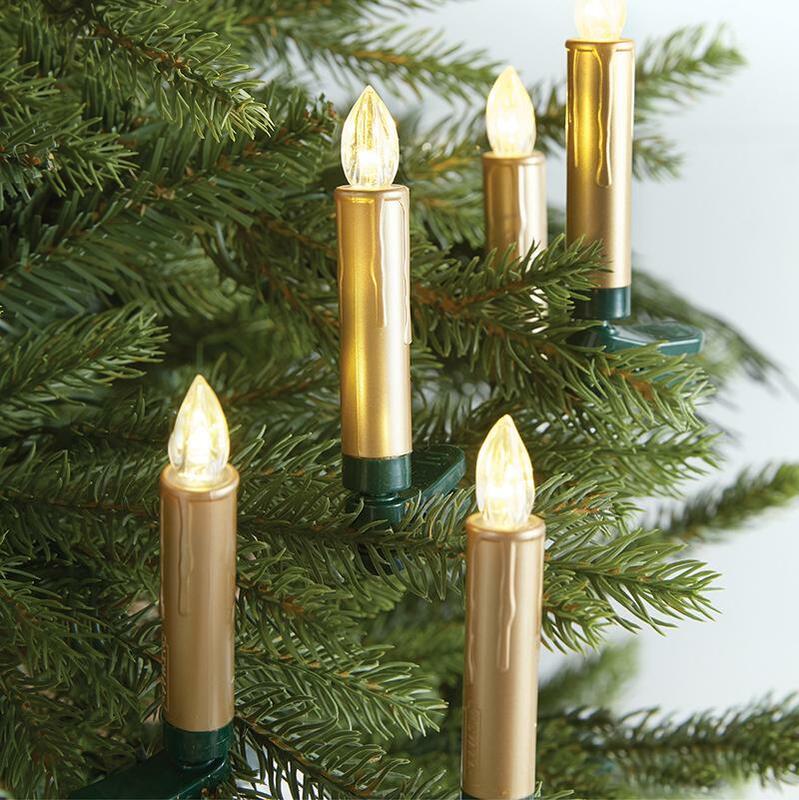 German inspired clip-on candles give you the freedom to add soft luminescence to your tree. These candles feature point and shoot remote with three light functions. Each box includes 10 candles with a light life of approximately 15,000 hours. 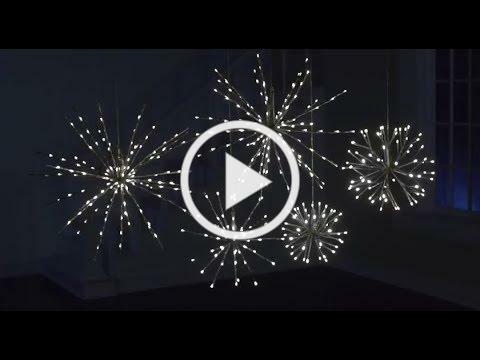 Another great decorative idea are these lighted starbursts. 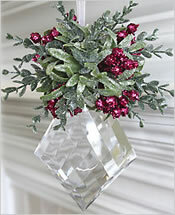 They can be used as a tree topper or hung singly or as a group over an area to create a dramatic effect. 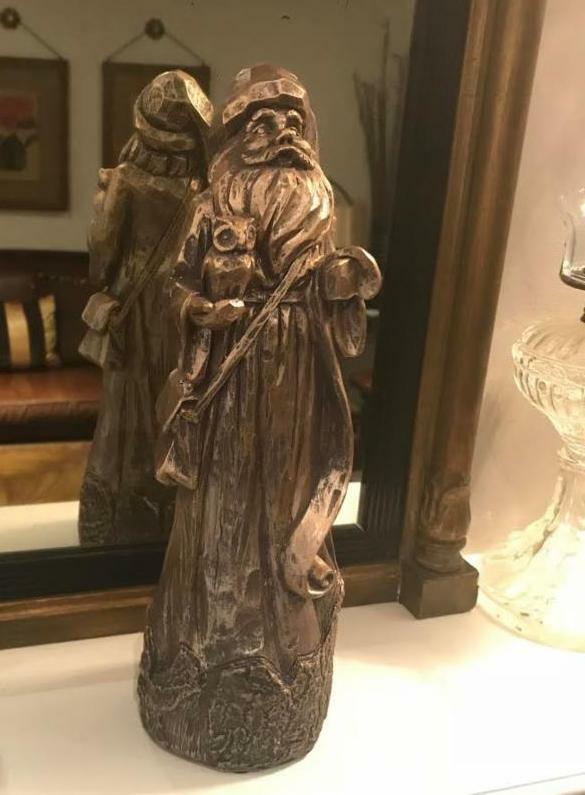 Many people come to Crafted Decor each Christmas looking for our selection of nativities as we have become the 'go to" place for this hard to find category. 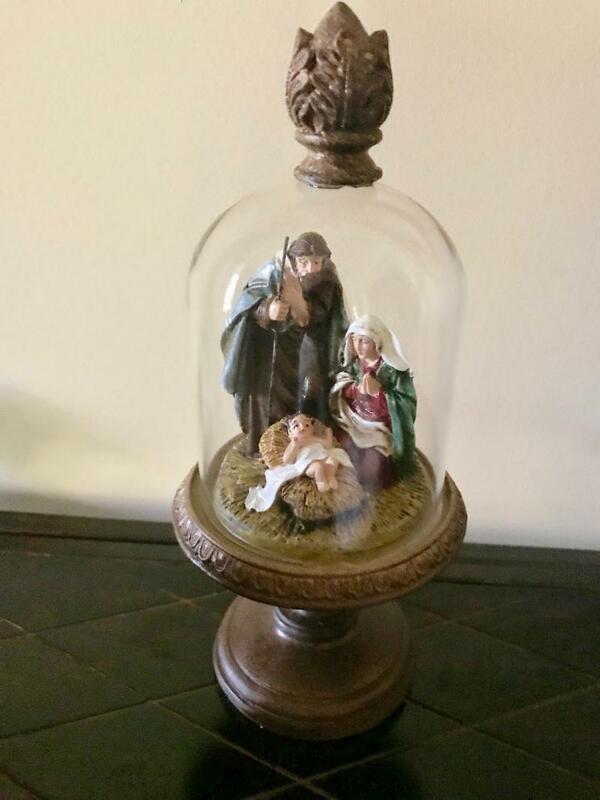 One item that could be a timely bonbonierri or party favour for those celebrating a confirmation or communion, or for a those looking for a religious gift; is this wonderful nativity in a glass dome (9"). This Christmas season, we have assembled some specials in appreciation of your patronage. 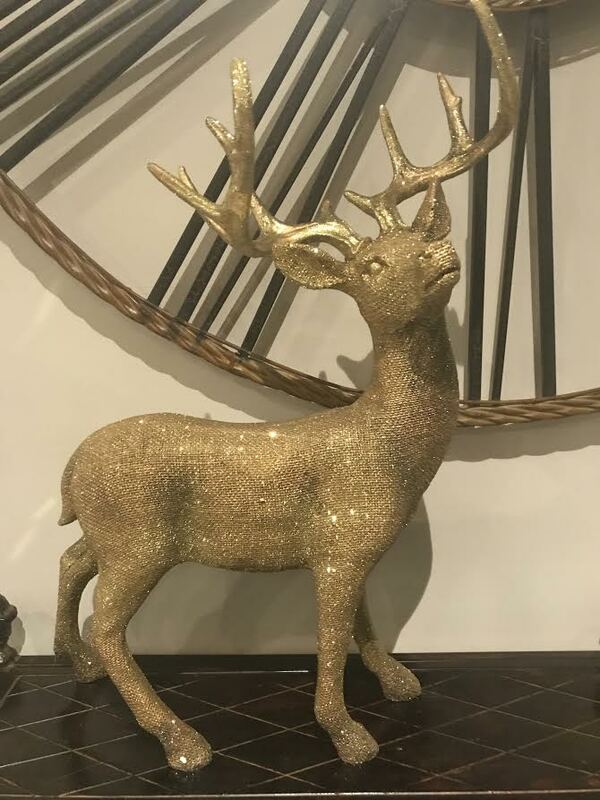 Make a purchase of $500.00 before tax to receive a beautiful deer, a stunning statement piece that can easily transform from holiday to winter decor. Your choice of gold or brown. - whenever you are ready. The first Wednesday of every month is Senior's Day. We only send our email newsletters to our current or past customers. A new Canadian law effective July 1, 2014 requires us to confirm that you wish to receive such information. Every email we send has an "UNSUBSCRIBE" option at the bottom of the page which you can use at any time to take yourself off our email list. Please note, we do not buy, sell or trade email addresses; your email address is strictly used for our business to inform you of upcoming events and news.